This quarterly financial report has been prepared by management as required by section 65.1 of the Financial Administration Act and in the form and manner prescribed by the Treasury Board under the Treasury Board Directive on Accounting Standards: GC 4400 Departmental Quarterly Financial Report. It should be read in conjunction with the Main Estimates and Supplementary Estimates for the current year. The quarterly report has not been subject to an external audit or review. The Canadian Transportation Agency (CTA) is an independent, quasi-judicial tribunal and regulator which has, with respect to all matters necessary for the exercise of its jurisdiction, all the powers of a superior court. We operate within the context of the large and complex Canadian transportation system. The CTA exercises its powers through its Members, who are appointed by the Governor-in-Council. We help ensure that the national transportation system runs efficiently and smoothly in the interests of all Canadians, including those who work and invest in it; the producers, shippers, travellers and businesses who rely on it; and the communities where it operates. We protect the human right of persons with disabilities to an accessible transportation network. We provide consumer protection for air passengers. Rule-making: We develop and apply ground rules that establish the rights and responsibilities of transportation service providers and users, and that level the playing field among competitors. These rules can take the form of binding regulations or less formal guidelines, codes of practice or interpretation notes. Dispute resolution: We resolve disputes that arise between transportation providers on the one hand, and their clients and neighbours on the other, using a range of tools from facilitation and mediation to arbitration and adjudication. Information provision: We provide information on the transportation system, the rights and responsibilities of transportation providers and users, and the CTA's legislation and services. Further information on the CTA’s mandate, roles, responsibilities and programs can be found in Part III of the Estimates – Departmental Plan. This quarterly report has been prepared by management using an expenditure basis of accounting. The accompanying Statement of Authorities includes the CTA's spending authorities granted by Parliament, and those used by the CTA consistent with the Main Estimates and Supplementary Estimates (as applicable) for the 2018-2019 fiscal year. This quarterly report has been prepared using a special purpose financial reporting framework designed to meet financial information needs with respect to the use of spending authorities. The authority of Parliament is required before money can be spent by the Government. Approvals are given in the form of annually approved limits through appropriation acts, or through legislation in the form of statutory spending authority for specific purposes. The CTA uses the full accrual method of accounting to prepare and present its annual departmental financial statements that are part of the departmental results reporting process. However, the spending authorities voted by Parliament remain on an expenditure basis. 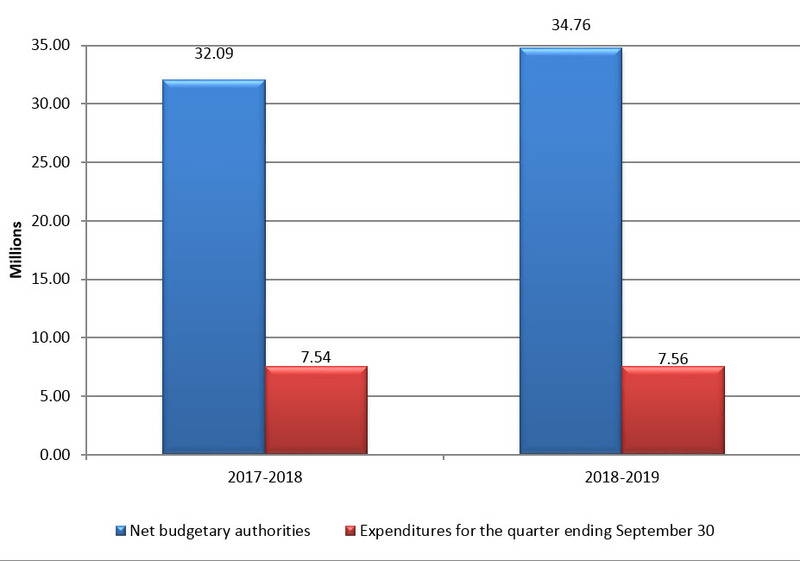 The figure illustrates the Agency's net budgetary authorities and expenditures for the quarter ending September 30, for fiscal years 2017-2018 and 2018-2019 where budgetary authorities and expenditures, in millions of dollars, is shown on the vertical axis and time period, in fiscal years, is shown on the horizontal axis. The CTA’s total authorities available for use in 2018-2019, totalling $34,763,628, have increased by $2,670,945 when compared to the same period in the previous fiscal year as illustrated in the Statement of Authorities and in the Departmental Budgetary Expenditures by Standard Object below. This increase is primarily attributable to the new funding received ($2,414,177) to support the CTA's modernization initiative, as announced in Budget 2018 and additional funding received ($599,745) to fund new collective agreements. This increase is partially offset by a negative adjustment ($125,791) to reflect the revised Employee Benefit Plans (EBP) rate and a reduction in the operating budget carry forward ($222,186). The expenditures in the Transportation and communications, Information and Professional and special services categories have increased by $167,967, $84,352 and $99,914, respectively, over the previous year. Following the coming into force of the Transportation Modernization Act on May 23, 2018, the CTA consulted broadly with the travelling public, the airline industry, consumer rights groups, and other interested parties to develop new air passenger protection regulations that will ensure air passenger rights are clear, fair, consistent and transparent. These consultations were conducted using a variety of channels such as eight in-person sessions across the country, in-person meetings with stakeholders and surveys with air travellers at select airports across Canada, which resulted in an increase of these expenditures. A reduction can be seen in the Personnel category in comparison to the previous year. This reduction of $293,364 is primarily due to the financial impact of the signing of several collective agreements in the second quarter of the 2017-2018 fiscal year. On the other hand, without considering this adjustment, there is a slight increase in Personnel expenditures primarily due to additional resources required to address the influx of air travel complaints. With respect to all other budgetary expenditures by Standard Object, overall expenditures are similar to those of the previous fiscal year. Any difference is primarily attributable to the period in which the purchases were settled. As reported in previous quarters, the CTA continues to face increased demand for services, particularly those related to air travel complaints. The CTA will continue to monitor the allocation of resources to address operational pressures and ongoing priorities. Although there have been no significant changes in the nature of the CTA's operations or programs over the last quarter, the CTA will continue to exercise rigour and scrutiny in relation to its resources.